Purrrfect for adults and children of all ages! The most beloved family show in the world, featuring an amazing cast of housecats, dogs, parrots… even geese and mice! Critics describe the show as a unique blend of physical comedy, world-champion juggling and the extraordinary talents of more than 30 performing pets. Gregory Popovich has rescued these animals from shelters all over the country and has transformed them into Las Vegas stars. Popovich is a fifth-generation circus performer who learned early on how to develop strong bonds with animals. He released his first book “You CAN Train Your Cat” in late 2009 and has been featured on The Tonight Show, David Letterman, in USA Today and People Magazine. 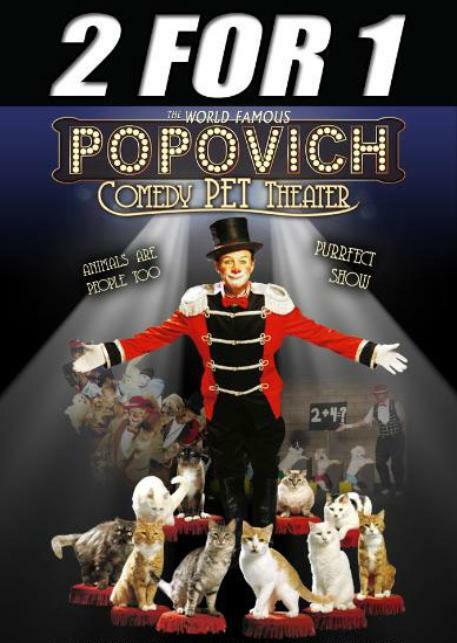 As seen on the Tonight Show, Letterman, and America’s Got Talent, Gregory Popovich’s Comedy Pet Theater is a blend of unique comedy, world-championship juggling, and the extraordinary talents of performing pets. His amazing cast of dogs and cats have been rescued from animal shelters and transformed into Vegas stars! Comedy Pet Theater is guaranteed to surprise and delight every audience and is a perfect family show. For every ticket purchased $1 will be donated to a local pet shelter! Please note: The show is currently on tour. It will return to Las Vegas on May 24, 2019. Self-parking is free in the Miracle Mile Shops garage, located off of Audrie Street.